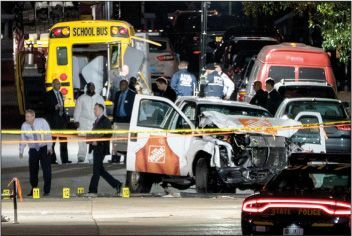 Eight people were killed and 11 others injured this week when a suspected terrorist drove a pickup truck along a New York City bike path, mowing down cyclists and pedestrians near the World Trade Center before slamming into a school bus. Sayfullo Habibullaevic Saipov, 29, a native of Uzbekistan who came to the U.S. in 2010, allegedly sped down the path for 14 blocks, leaving a trail of mangled bicycles in his wake, before exiting the truck carrying a paintball gun and a pellet gun and shouting “Allahu akbar!”—Arabic for “God is great!” He was shot and wounded by police moments later. Authorities said they found a note in his vehicle reading in Arabic “ISIS lives forever.” Saipov, who lives in New Jersey, had become radicalized domestically, law enforcement officials said, and followed ISIS’s instructions for truck attacks “almost exactly to a T.” Authorities later announced they were seeking information about a second Uzbek man, 32-year-old Mukhammadzoir Kadirov, in connection with the attack. “Terrorists, like school shooters, learn from other attacks,” said Peter Bergen in CNN.com, and “no tactic has spread more quickly” among aspiring jihadists than masscasualty truck rammings. Since 2014, when ISIS first urged its supporters to weaponize vehicles, terrorists have plowed into crowds on 15 occasions—mowing down pedestrians on London Bridge, at a Berlin Christmas market, and now a New York bike path. “Simple to mount and largely unstoppable,” such attacks have already killed 142 people.